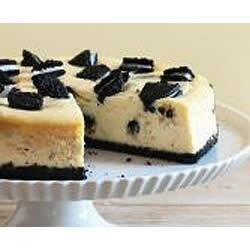 "Easy to prepare, this cheesecake is a great dessert to bring to your next get-together. " Heat oven to 350 degrees F. Place 16 of the cookies in resealable plastic bag. Flatten bag to remove excess air, then seal bag. Finely crush cookies by rolling a rolling pin across the bag. Place in bowl. Add butter; mix well. Press firmly onto bottom of 9-inch springform pan. Beat cream cheese, sugar and vanilla in large bowl with electric mixer on medium speed until well blended. Add eggs, 1 at a time, beating just until blended after each addition. Chop or crush remaining 8 cookies. Gently stir half of the chopped cookies into cream cheese batter. Pour over prepared crust; sprinkle with the remaining chopped cookies. Bake 45 min. or until centre is almost set. Cool. Refrigerate 3 hours or overnight. Cut into 12 pieces. Store leftover cheesecake in refrigerator. Simple and delicious cheesecake that easily is excellent on its own! This came out pretty good, I did what the other reviewers suggested and added 1/2 a cup of heavy cream and 2 tablespoons of sour cream and 2 tsp of vanilla instead of just 1. This is a cheesecake lover's cake. It was very rich and dense. It was also super simple to make. I followed the recipe exactly. I would add more oreos to the batter if I made it again.